The Butterfly Effect Project and Riverside Rediscovered are hosting a workshop in Riverside this Thursday, Oct. 12 from 6 to 8 p.m. on helping people with criminal convictions work to clean up their records to help them find employment. 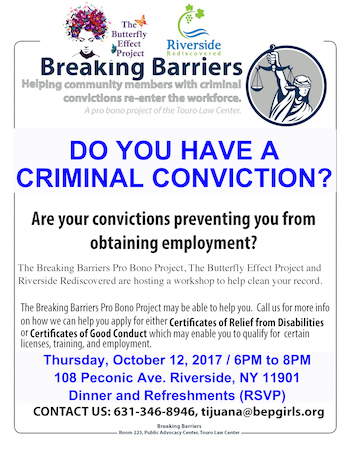 The workshop will be lead by Breaking Barriers, a pro bono project of the Touro Law Center, which will help community members with criminal convictions apply for Certificates of Relief from Disabilities or Certificates of Good Conduct, which may enable them to qualify for certain licenses, training and employment. The workshop will be held at Riverside Rediscovered’s headquarters at 108 Peconic Avenue. Dinner and refreshments will be served. To RSPV, contact 631.346.8946 or tijuana@bepgirls.org.